Happy Tuesday! Today's post is going to about one of my favourite things of all time.. Yes lipsticks. I know that might sound a bit odd, but I absolutely love them. I love how a lipstick can match your mood and make you feel totally fabulous about yourself. I sometimes even use them as a blush if they have a moisturising formula like the lovely lipstick I'm going to be talking about today. I have to admit Chanel lippies are by far my favourite and I have a definite soft spot for the Rouge Coco Shine range and the shade Secret is my latest addition. I hope you enjoy today's post lovelies and I would love to hear from you all in the comments section down below. It really does make my day when I see comments from my readers and I appreciate the time you take to make the effort to comment. You can also contact me through my social media if you would like a more direct response off me. Before I get started.. Major OMG that my favourite lipstick of all time The Chanel Rouge Coco Shine in the shade 48 Evasion has been discontinued. I always made sure I had at least another one of Evasion in my collection for a time like this! but I totally didn't realise I was on my last one and when I went to re-purchase I was completely shocked to see it had been discontinued. Anyway (Rant over haha) I decided to head out to my local John Lewis to find something similar enough to my beloved Evasion lippie! Secret was released as part of the Chanel 2013 Superstition collection, which was based on Gabrielle Chanel's belief in good fortune. Rouge Coco Shine's are known for their highly moisturising and water-light foundation. If you have ever tried the Chanel Vitalumiere Aqua foundation and love how light and effortless it feels... then you will love the lipstick equivalent, which is the Rouge Coco Shine range! 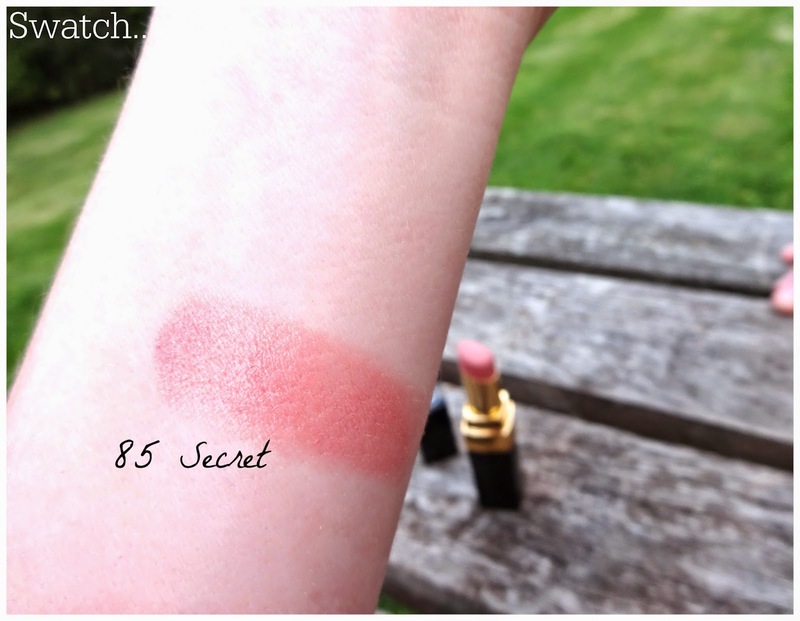 When swatching Secret it appeared to be closeish to Evasion, as its a very pretty peachy/pink which works with pretty much every single make-up look. However, when I got it home and tried it on I realised it was slighly more on the Pink side, which made it less similar to Evasion than I was hoping. Evasion leans slightly more peach on the lips, but both shades still give that Pinky/Peachy look. I decided to stop trying to compare "Secret" to my beloved Evasion and then I realised what a gorgeous lipstick it was. A soft shimmering pink with a hint of peach is probably the best way to describe Secret, which makes it an absolute beaut for an everyday lipstick. The slight downside of this lipstick is that is one of the more sheer options from the RCCS range. Most of them are sheer, but a few do have really good coverage and then a few are perhaps a little too sheer to warrant the £25 price tag. Overall, I'm super happy with "Secret" but if you are looking to splurge on a RCCS lipstick I would probably visit a counter and look for one with a little more pigmentation. I hope you have enjoyed today's post lovelies! I would love to hear a little more about your favourite lipsticks and perhaps any that haven't been worth the hype? What I can't believe that Evasion is being discontinued! This looks lovely but probably more pink toned? 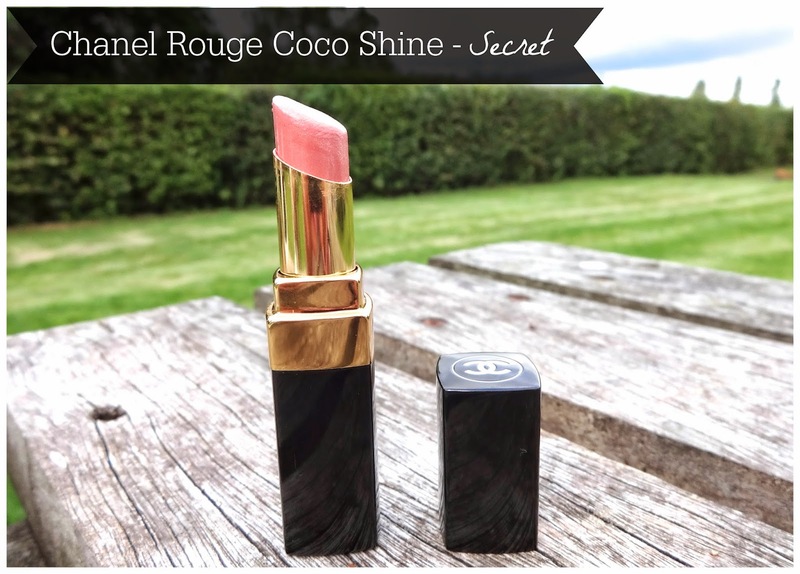 I love the rouge coco shine range, they are such moisturising lipsticks. Once in a while, I really enjoy wearing a more sheer option on my lips that will nourish them and add a bit of colour, so they are great for that; Secret looks like such a gorgeous shade to apply with any makeup look!